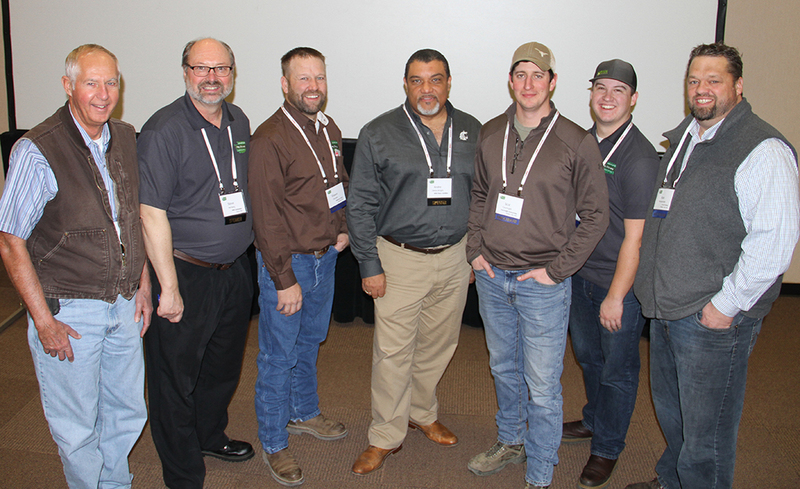 CAHNRS Dean André-Denis Wright, center, with Washington State Haygrowers Association President Shawn Clausen, CAHNRS researchers, and Association members at the Northwest Hay Expo. Showcasing the fertile results of their partnership with growers, hay scientists and students in the College of Agricultural, Human, and Natural Resource Sciences and Washington State University Extension were joined by CAHNRS Dean André-Denis Wright at the Northwest Hay Expo, Jan. 16 in Kennewick, Wash.
Hay is one of Washington’s top 10 agricultural commodities, with a more than half-billion-dollar crop in 2017, according to the Washington State Department of Agriculture. The Washington Hay Growers Association represents the farmers growing feed and fiber crops that fuel global industries, from Northwest dairy cattle to pets large and small and livestock around the world. Association support powers research at WSU to better understand and manage a wide range of hay and forages. At the Expo, scientists delivered answers and ideas, presenting to hundreds of farmers alongside experts from industry, partner universities and agencies. Dean Wright chats with growers at the Northwest Hay Expo, Jan. 16, 2019, in Kennewick. Dean Wright, who gave the keynote address Wednesday, shared the college’s goals and accomplishments on behalf of farmers, the importance of student support, and his own international academic journey in animal sciences. “Industry support is vital to the work we do, and enables us to continue serving growers across the state,” he said. In presentations, Crop and Soil Sciences research agronomist Steve Fransen helped growers understand how to help their crops pass hay tests, as well as the poisonous weeds that can infiltrate hay and how to control them. He shared the importance of clean fields and seeds, as well as soil fertility and irrigation for strong, dense stands, in weed defense. 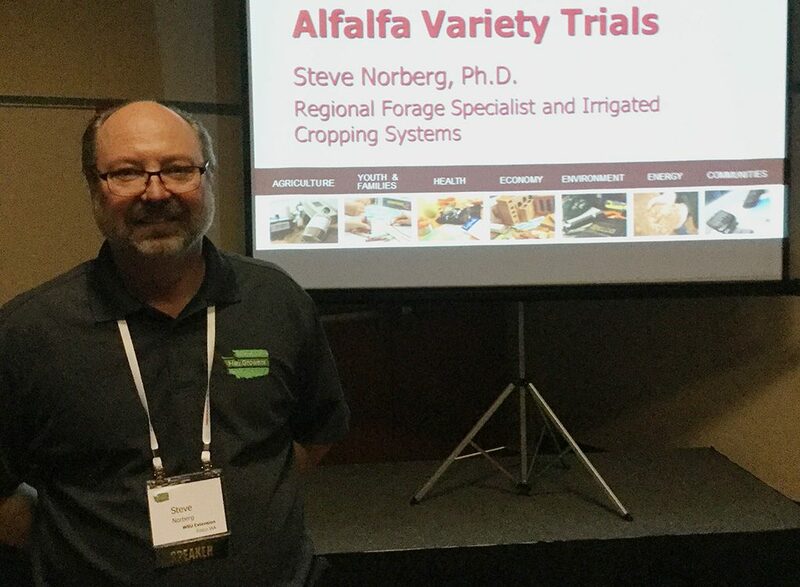 Steve Norberg, Extension forage and irrigated crop specialist, shared results of variety trials for quality and yield, held jointly by WSU and the Washington Hay Growers Association, encouraging growers to review those returns before making planting decisions. Norberg also gave an update on development of a tissue test for alfalfa fertility, which holds the potential to boost yields. Lav Khot, assistant professor in the Department of Biological Systems Engineering, helped growers understand drone data for better alfalfa management. With case studies, he explained how multispectral and thermal imagery data can be used to scout crops for variations in vigor, nutrient deficiencies, water stress and leaks in their irrigation systems. Graduate student Natalie Shaw shared how to grow low-carbohydrate horse hay, while Erin Mackey gave a talk on struvite, a phosphorus fertilizer recovered from manure and wastewater streams that can be used for growing alfalfa. Learn more about WSU Extension research and publications here. Members of the WSU hay and forage team on the Hay Expo convention floor: Mike Clouse, Mark Weber, Steven Norberg, John Steinbock. WSU research agronomist Steve Fransen greets Dean Wright at the Expo. The convention gave CAHNRS researchers the opportunity to share ongoing research and best practices with the state’s $500 million hay industry. Dean Wright meets CAHNRS alumnus Jon Paul Driver, attending from Northwest Farm Credit Services, at the Expo. Steve Norberg, Extension forage and irrigated crop specialist, shares results of hay variety trials.